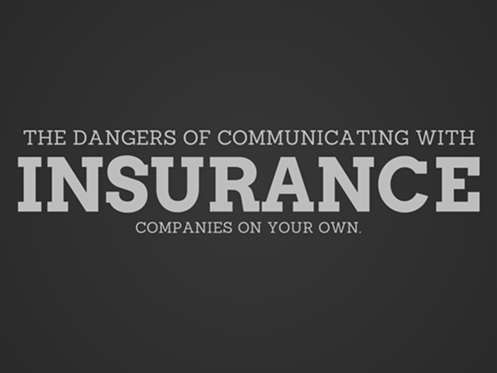 Answer: Communicating with an insurance company on your own can be like walking through a minefield. What should you say? What shouldn’t you say? Are they later going to use my statements against me? Insurance companies are generally not in the “friend” category. Despite what may seem like “friendliness”, they are not there to try to figure out how they can pay you a bunch of money for your injury claim. If you are trying to handle your personal injury case on your own, three words of advise: BE VERY CAREFUL. You see, insurance companies do not really treat people like they say on their commercials. In “good hands”? Not if you are on the other side. Like a “good neighbor”? Not like any neighbor I want to have. 15 minutes…. ? Might cost you a whole lot more than 15% if you say the wrong thing. If negotiating on your own, 1) never give a recorded statement and 2) never put your arguments and issues in writing. If an attorney writes it, it is attributable to the attorney and part of the negotiation. If you write it, then it constitutes your own words and might well be used against you at any stage of the case. Not sure what to do or say? Why not seek advice and a free consult with an experienced injury lawyer? The old adage is that “an ounce of prevention is worth a pound of cure”. If you deal with the insurance company on your own, and say the wrong thing, a “cure” may not even be possible.